another pitching prospect...Dotson goes to Texas in middle of 12th round. Go get em Coach Latham. 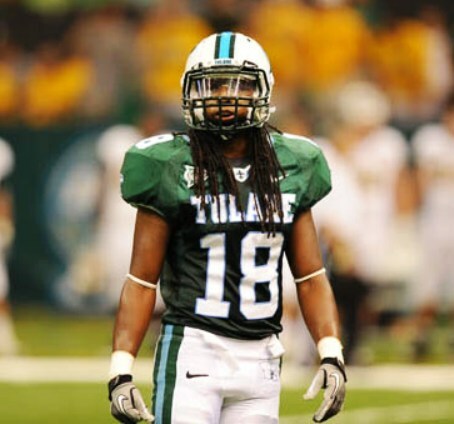 Need that young man in a Tulane uniform. Sorry about the additional post. I sure hope he comes to TU. Let Latham work with him for 3 years, and then he gets drafted in the 1st round. This is an interesting spot for him to go. Being picked in the 12th round, there is no slot value, so there is no penalty for Texas spending well over "12th Round money" to sign Dotson. This is going to depend on several factors: Texas' budget, Dotson's demands, whether Texas can sign all of their higher picks and whether Dotson thinks he'll do much better in 3 years. Going to be interesting...but this is a little early for a team to take a kid who they don't think they can sign. “It’s such an honor to be included as part of the draft and have that opportunity to start my professional career early....."
color him gone, I guess. This is one I was hoping we’d hold on to. It would never happen, but there should be a rule that once you sign a LOI, you revoke your right to be drafted until your sophomore year. This is such a tough decision. Knowing what I know now, I would say go pro and get yourself in the system IF your son is mature enough (there are so many obstacles to consider). Six years ago, I did say go to college. Unfortunately, injuries can derail your opportunity in a second. I wouldn’t second guess myself. Who is to say he wouldn’t have gotten hurt after a few years of riding busses and have zero college under his belt. Yes, one can say he could have pursued an education later in life but very few do. Woulda coulda shoulda. 3 years of school & good handling & luck and he could blow this offer out of the water. He is the exact sort of prospect who could do this. Why not offer some kind of insurance policy against a career ending injury for any kid that gets drafted but decides to go to college or return to college. Make the major league clubs pay for it. I do not think it benefits either the kid or a major league team if a kid goes pro for fear of injury at the college level. I think the NHL has a rule that if you draft a kid that does not make it you have to pay for his college education when he is done playing. It sure would be nice if baseball did soemthing like that. I am not saying the full cost of a 4 year Tulane education for a kid that doesnt make it past A ball but at least something to help defer the cost so a kid can try and get an education if his dream does not pan out. I would have a very tough time if my kid accepted an offer unless it is a ton of money and/or he will be guaranteed an education if it does not work out. I am not sure what the percentages are but I am guessing that even for a 12th round pick the odds of ever getting called up are small. He is a 12th round pick and is going to get a very good offer. Like TU23 said, this one is going to be interesting. The odds of making it as a 12th rounder out of high school or going to college for three years and blowing it out the water are both long shots. You can always get the education. This may be your only shot to play at the highest level. An honor student, Dotson was part of the engineering magnet program at Scotlandville (Magnet) and plans a college major in mechanical engineering. Nobody else saw the issue in this quote but me? No use in stating the obvious. I find it interesting that Texas drafted 27 pitchers among their picks. 23 right-handed pitchers and 4 lefties, including Destin Dotson of course. That was a decision MLB made when Jones was still here. I remember him telling us about it being a rule that teams had to include a tuition clause in their contracts. I don't remember the specifics but I seem to recall it having something to do with an agreement with the NCAA. I cannot recall the names of the players, but a number of years ago TU had 2 players drafted in the 12th and 13th round of the MLB draft. I believe 1 was a pitcher and the other was an outfielder. Unfortunately, they both signed for appox $150,000 each. Any one recall those players or when that occurred? I remember in 2008 we had Ross Seaton taken in the 3rd. JP Ramírez in the 15th and TJ House in the 16th. House was the only one to make it to the show. On the flip side, the same year Jamie Bruno turned down the Mets offer as a 15th round pick and came to Tulane. That didn’t work out too well either. The Bruno situation shows that it can work both ways. Going to college doesn't always mean a better draft spot three years later. In his case, he should have known he couldn't hit breaking balls and just taken the money and run. I remember now all those names u presented. I also remember seeing the fellow Ross Seaton talking about his signing on ESPN. Seaton pitched several seasons in the minors but has not pitched or been active in high minor pro ball since 2015-16. He was a supplemental third round pick and signed for a reported $700K.